Discover The Best Hot Sauces In The World! If you’re looking for hot sauce reviews and the best hot sauces the world has to offer, you’ve come to the right place! Everyone knows that hot sauce makes just about any food taste better… even desserts. Hot sauces come in many different variations. They can be mild. They can be hot. And some can flat out make you cry! With all the different kinds of hot sauces out there, the question everyone asks is, “which are the best hot sauces“? Our community of hot sauce experts try, review and rank just about every hot sauce on the market. Then we personally test each one on different foods using a variety of criteria. Lastly, we write up a review and film a video about each hot sauce so you can decide if it’s one you should try or not. So keep reading to learn more about hot sauce… or you go go straight to our updated list of the best hot sauces. Why Is Hot Sauce So Popular? In fact, it’s now growing faster than mayonnaise, ketchup, and mustard– COMBINED! Many believe it’s because of the rising immigrant population in the United States… Asian and Latin American immigrants bringing over their penchant for spicy cuisine. Add to that the fact that the younger generation (Millennials) tend to be more adventurous in their eating habits. Finally, there’s been huge growth of in the number of “Foodies” out there who love trying new things! Add it all up and hot sauce is now a billion dollar industry… and doesn’t look to be slowing down anytime soon. How Did Hot Sauce Come To Be? According to researchers, hot sauce’s core ingredient, the chili pepper, originated 8,000 years ago in the Amazon jungle. It spread throughout the continent… and then made its way to South America, Central America, and eventually North America and the Caribbean. Rumor has it, when Columbus landed in 1492, he mistook the chili pepper plant for black peppercorns, naming them peppers. Of course, chili peppers are the primary ingredient in hot sauce. In the US, the first reported hot sauce was bottled in 1807. Now there are literally thousands of different hot sauce options around the world. So, no matter where in the world you are, you’ll find a variation of hot sauce within your reach. If you’re looking for a particular type of chili pepper, be sure to check out our Giant List Of Chili Peppers! So What Are The Best Hot Sauces For 2019? This is the reason you probably came to HotSauces.com to begin with! After trying out nearly every popular hot sauce out there, we’ve put together a ranking of what we think are the best hot sauces out there. First, we go out and physically buy every hot sauce we can find. Whether it’s made with bell peppers, poblano, cayenne, habanero and whatever else they put in there, we buy it and try it out! We try them with different kinds of food and judge them based on their initial flavor, spice level, ingredients, how they smell and of course, how they taste. We also look at the price, how long a bottle lasts and if the company offers any guarantees. Once we’ve done all that, we assign each hot sauce an overall rating and compare it against all the other hot sauces we’ve tried (which is A LOT). And that’s how we come up with our continually updated list of the best hot sauces currently available. One other thing before we go to the next section… if you have a hot sauce you’d like us to try, just shoot us an email or contact us on social media. We don’t accept free hot sauces from manufacturers, but we’ll go out and buy whatever you’d like us to try! What Exactly Makes A Good Hot Sauce? If you’re looking for the best-tasting hot sauces, you’ve first got to ask yourself what exactly makes a hot sauce taste good? To answer that, we need to explore what hot sauces are made of. Keep in mind, not all hot sauces need to be “blow your head off” spicy. In fact, most hot sauces are more mild than ridiculously hot. 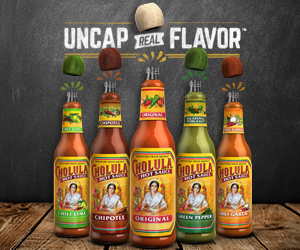 Hot sauces are all about adding flavor to foods… about enhancing flavors. And that comes from depth of flavor from a unique combination of ingredients. So let’s start with the primary ingredient in all good hot sauces- chili peppers! For the last 8,000 years, chilies have been spread throughout the world, and as a result of various farming techniques, the humble chili has take on a number of different forms. When it comes to hot sauce, the heat from a pepper can be impacted by a number of factors including: growing environment, fresh vs dried, roasting, and preparation (removing seeds and ribs). Speaking of seeds, in chili peppers, the seeds and ribs contain a large amount of capsaicin. 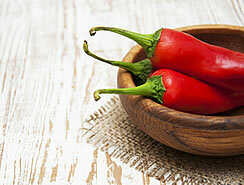 Capsaicin is the active ingredient that creates that “heat” sensation we all know and love. 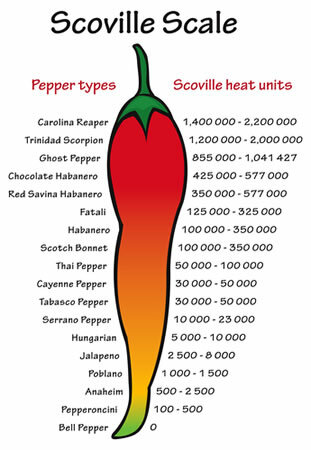 This heat is measured on the Scoville scale, a measurement developed by American pharmacist Wilbur Scoville in 1912. The Scoville scale ranks peppers on the amount of heat they contain… the higher the number the spicier the chili pepper! Some well known chili peppers have the following Scoville ratings. I think you could peel paint with some of the spicier chili peppers! For a full rundown of all the different chili pepper types, take a look at our Giant List Of Chili Peppers. Now hot sauce isn’t just chili peppers… there are other ingredients too. And those other ingredients can add depth of flavor, thickness to the sauce, and compliments like sweetness, saltiness, and acidity. If you’re looking for some amazing recipes that incorporate some of these peppers, be sure to check out our post, Six of the Greatest Pepper Sauce Recipes of All Time! What Are Some “Other” Ingredients You Can Find In Hot Sauces? But there are a few critical ingredients that are found in most hot sauces… and we’ll touch on them here. Let’s take one of the most basic hot sauces on the market- Tabasco. Tabasco has three ingredients – Chili peppers, Salt, Vinegar. Some hot sauces add other ingredients like garlic or onions… others add sweetness, like fruit, fruit juice, sugar, or honey. Still others add earthiness to their sauces with tomatoes, carrots, and other herbs and spices. Still more flavor and saltiness is added with ingredients like fish sauce or anchovies, which are very popular in some Asian hot sauces. Don’t forget that vinegar is used in the sauce too. Plain white vinegar has a bite… champagne vinegar is sweet, and malted vinegar gives off earthy flavors. Like I said earlier, the different combinations of ingredients is limitless… and all impact flavor! That said, the biggest mistake budding “chili heads” make is thinking the taste of the hot sauce is only about the ingredients. Preparation is also very important when it comes to hot sauces. If you love that smoky flavor of a Mexican hot sauce, the chilies and other ingredients were probably fire roasted. Some sauces add different flavor profiles by fire roasting over different types of wood (mesquite, hickory, post oak, applewood, etc), each giving off it’s own flavor! Another impact to the flavor is the ageing process. As you can see, hot sauces, despite their simplicity of ingredients, can be very complex. And the best hot sauces are more than just heat – they add flavor and a taste to foods that can’t otherwise be found. To see which hot sauces we recommend right now, be sure to check out our ranking and reviews of the best hot sauces from around the world.